One of the most confusing and perplexing issues one can run into during OSD is trying to install a ConfigMgr Client Patch during OSD using the PATCH property. While many have developed methods that work for them, none of them really work in ALL situations or are ideal to run in locations with slow links. Running it from a Remote Share for example means your clients are traversing your WAN links to pull down updates. Depending on how many patches you apply, this could dramatically increase your deployment times. In addition, if your site is on a slow link, it could impact your WAN link availability if you image many machines. Other methods like to leverage the %_SMSTSMDataPath% variable as seen here. The issue I’ve had with this method is that while the value for %_SMSTSMDataPath% stays static, the Drive Letter where your packages are stored can change during the reboot that the Setup Windows and ConfigMgr step initiates. For example, if you are in WinPE and your system has 1 HDD. Next, you format the HDD with 2 partitions. 1 Partition for BitLocker, the other the OS. The first partition will be seen as C: by WinPE, the second will be D: or E: (depending if you have an optical drive or not). %_SMSTSMDataPath% would be assigned the drive letter of D: or E: (Wherever you OS goes) but after that reboot, your OS drive will be set to C: which is where the Windows OS goes (by default). In order to “fix” this once and for all, I decided to just copy the patch(es) to a static location on the disk as shown below. 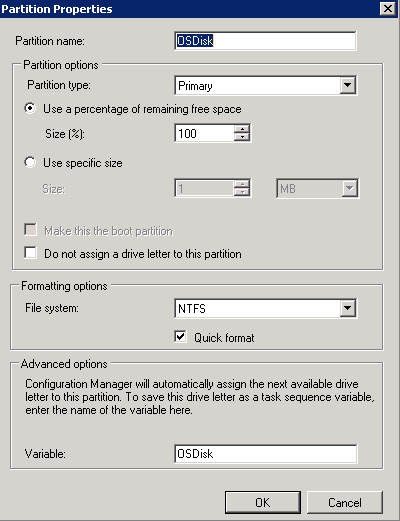 First things first, we configure our Format and Partition Disk step to store the Drive Letter to a variable “OSDisk”. Second, we configure our Apply Operating System Image step to apply the OS to a “Logical drive letter stored in a variable” Here we use the same ‘OSDisk’ variable as above. We then create a new Run Command Line Step immediately before the Setup Windows and ConfigMgr Step in our Task Sequence. 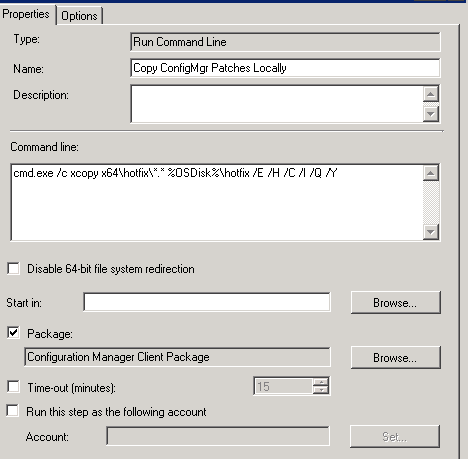 This step will copy the hotfixes from your ConfigMgr Client Package to your local disk. NOTE: You may need to update the source path according to how you store the hotfixes in the package. You can use multiple PATCH statements if needed, but this will apply CU2 for x64 systems. Lastly, you may want to run another Run Command Line Step to cleanup the C:\hotfix directory once you are all done. I’ve wrestled with this problem for a long time while looking for a solution that would work in all scenarios. This is brilliantly simple and covers all the corner cases. Great work! Dustin, this is a great article for all SCCM admins who have struggled with hotfixes. In fact, each time I see a CU update, I am hesitant to deploy because of this issues with OSD. Thank you very much for this insight, it certainly helps! I cant get this to work ! I have tried the cmd.exe command both with x64\hotfix path, and with a full UNC path. Both give same results, what the hell am I missing ? I have my Task Sequence deployments set to download contents locally instead of running from the DP. Never tested it that way. Great idea! We’ve just been putting patches on the drive during build and capture. No need for the “PATCH=” during OS Deployment. Simply create the folder “ClientPatch” under the respective architecture x64\ClientPatch and i386\ClientPatch. Copy the MSP file to these folders and update the DP for the SCCM Client. During OS Deployment, the CCMSETUP will download and install these patches automatically.. If you have the MP located on dedicated servers, create the same structure there at SMS\Client\x64\ClientPatch. This is great once you have properly tested any and all patches. I am trying this but the xcopy just sits there and does not do anything. Have you seen this before? Any suggestions? Checked your command? Check the Package Data source directory to see if it has eg. \\SCCM01.local\SMS_01\hotfix\KBID\Client\x64.. If this is the case just amend the xcopy to just have “*. *” instead of “x64\*. *”, adjust as per the data source directory. where is the location – this is a tad confusing to be honest? if people are to come up with suggestions i wish they would really and fully explain themselves? Thanks, this worked well for me. I installed the version that came along with SCCM 2012 R2 CU2 update. Only thing I had to do, add a cmd line that created the hotfix directory before I copied the file into it, I would receive a question before that said “is this a file or a folder” and the TS halted. just trying to figure out what the best way to do that. Certain updates contain additional fixes applicable during the OSD process which is why I tend to include the update in my Task Sequence. Not mandatory per se, but I find it is simple to setup and ensures my clients are up to date right away. Simply follow my suggested solution, posted 13 Janary 2014. That works and is an better solution..
Hi all, I have been spending a considerable amount of time trying to get R2 CU2 to install in our environment during OSD and the only way that it worked for us was to use the ClientPatch folder method – anything else that we tried just failed. We are using SCCM 2012 R2 CU2 Server, Deploying Windows 8.1 Pro x64 image (build and captured with R2 CU2 client/patch), boot image is WinPE 5.0 x64 and we are applying the x64 version of R2 CU2 via the ClientPatch method as mentioned before. Any ideas on what might be going on here would be greatly appreciated. I might cross-post this to other places on the internet as well to see what I can find.